The outside of the new carpentry building at Cannon County High School. If there had been an official scorer present for Thursday night's meeting of the Cannon County Board of Education at Cannon County High School, he or she would have recorded some winners in their bid for board approval, and some who were not as fortunate. • Ed Coats, carpentry teacher at CCHS. 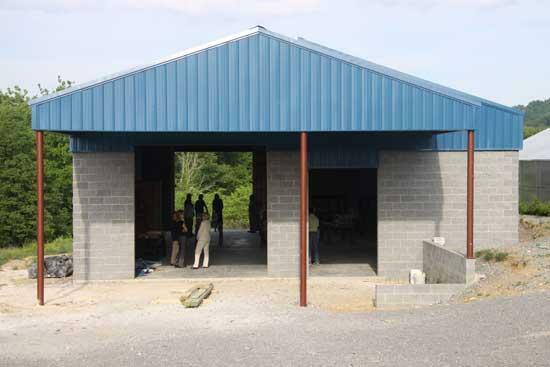 The board gave approval to his request for an additional allocation from Capital Outlay of $7,600 for overhead doors for the new carpentry building at the school. • The Cannon County Education Association. The board approved the Negotiations Agreement with the teachers for the fiscal year 2010-2011. Included in the agreement is a three percent increase in pay, plus assistance with the purchase of insurance. The agreement is subject to the approval of the Cannon County Board of Commissioners. • Schneider Electric, which saw its Energy Savings Project proposal rejected by the board following months of presentations and discussion. • Jim Gibbs, whose offer to implement a Gang Resistance Education and Training program at elementary schools was turned down. • Crystal Nichols, who was asking the board to overturn a decision by Short Mountain School staff and a review committee to have her son retained in kindergarten. The board voted to affirm the decision of the school officials. • Voted to reopen the process for soliciting bids for mowing work following confusion over dates for which bids would be accepted during the initial round. • Approved Randy Gannon, Chairman, and Barbara Parker, Director, as designated signatories on Board warrants. • Approved Douglas Jennings as Assets Manager. • Approved Douglas Jennings and Shannon Bacon as authorized agents to make electronic funds transfers for the direct deposit payroll. • Approved CCHS non-faculty coaches. They include: Silia Kailiponi, Volleyball; Darvin Gill, Girls Basketball; Jonathan Odom, Boys Basketball; Dennis Jordan, Softball; Ron Head, Girls Soccer; Cody Brown, Baseball; Jake Nokes, Baseball; Shane Yokley, Football and Joe Patterson, Football. • Approved Project Application for No Child Left Behind (NCLB) FY 2011, Preliminary Allocation Revenue Title I-A $437,702, Title II-A $106,362, Title IID $1,516, and carry over funding, including carryover Stimulus funding, pending approval by the state and final allocations and to include all future addenda and amendments. Prior to the meeting, Director of Schools Barbara Parker recognized scores of school personnel and students for their outstanding work, both during the current school year and during their educational careers. A list of those receiving recognition will be published in next week's edition of the Courier. The next Board Workshop will be at the Central Office on Tuesday, June 8, 2010 at 6 PM. The next Regular Board Meeting will be Thursday, June 10 at 6 PM. You forgot that the citizens of Cannon County and our children were also winners who emerged from the school board meeting by voting "NO" against spending $1.5 million in an effort to save $83,000 per year. Thank you to the school board for not falling into that "governmental" mindset of trying to outspend what you don't have and try to make people believe it will save money in the long run. Now, on to the next project. A middle school! Move forward and not backwards.